by Matt Jackson and Hugh Vass. 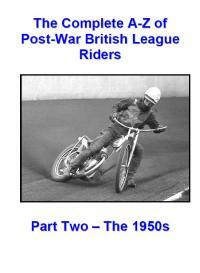 The second volume of "The Complete A-Z of Post-War British League Riders" is now available. As with the first this is only available on CD, the 346 pages contained within making it uneconomical to print. This remarkable publication details the career of EVERY rider to make their league debut during the 1950's - giving statistics for each season of their career along with a commentary on their exploits and achievements. The statistics and commentary do not only cover the fifties, where a rider's career continued into future decades those seasons are covered also - meaning that the coverage of the book extends well into the eighties with Ivan Mauger's 'home matches only' spell with Exeter. Mauger is just one of the sport's giants to fall into the scope of this volume - Barry Briggs, Ronnie Moore, Peter Craven and Ove Fundin also feature and (as you would expect) all receive lengthy write-ups. However, the real strength of this book isn't the coverage that those big names receive, their stories have all been told numerous times in the past and will be familiar to most. Instead this book's greatest virtue is the incredible level of detail that's included. It's doubtful that Dave Henton's career has been recorded in print previously, but he features here. Don't worry if you're struggling to place the name as his career consisted of a single match for Ringwood in the 1955 Southern Area League. His two rides yielded a single point and the match was subsequently expunged from official records when Ringwood withdrew from the league! The fifties were a particularly unusual decade for the sport and this is reflected in the publication. The vast majority of tracks closed down due to the punitive entertainment tax and as a result many riders careers were suddenly terminated or interrupted. There are numerous examples of riders who made debuts in the 1950-54 period who didn't ride at all for the rest of the decade. Thankfully Parker's Provincial League offered many a way back into the sport in the early sixties. There are other oddities also - such as the case of Eric Minall who took a twelve year sabbatical before resuming his career in the mid-sixties. I suppose that shows that Andrew Silver's lengthy lay-off isn't the first example of a surprising comeback. Sadly Eric's return proved less fruitful than Andrew's has. It's also a delight to revel in the names of those from years gone by, it's hard to imagine a Shorty Schirmer, Porky Veal or Niven McReadie lining up in this year's Premier League. Those of a certain vintage will love being reminded of Cyril Maidment, Clive Featherby, Ron Mountford, Dougie Templeton, Nigel Boocock, Olle Nygren, Trevor Redmond, Neil Street, Chum Taylor, Peter Moore, Bob Andrews, Charlie Barsby, Bob Duckworth, Clive Featherby and all their contemporaries. Matt Jackson and Hugh Vass are again the authors whose many years of hard work can now be enjoyed by us all. John Somerville's extensive photograph archives have been plundered and many of the rider profiles are illustrated with a portrait or action shot. Whether you want to use this as a reference work or simply something to read from cover to cover you won't be disappointed.